The photographic output of Manuel Carrillo is not as well-known as the work of Manuel Alvarez Bravo and Edward Weston, his contemporaries in Mexico and the United States respectively, but his stature as a master of traditional (now classical) photography is unquestionable. His beautifully crafted gelatin silver prints are testimony to a master image maker who approaches his subject with awe-inspiring wonder. In Mi Querido México Manuel Carrillo shows his love for his native country, its people, landscape, churches, architecture, and even its animals. He shows the strength, beauty, and dignity of the Mexican people. In his work we see the cycle of life and convincing expressions covering a broad spectrum of the emotions and feelings that make up the human condition. 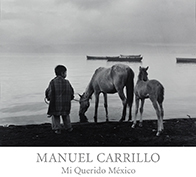 This publication will undoubtedly expand the knowledge and appreciation of Manuel Carrillo’s work and his beloved Mexico. Stuart Ashman is the president and CEO of the Museum of Latin American Art (MOLAA). He is the former curator and director for the New Mexico Museum of Art and the former secretary of cultural affairs for the state of New Mexico.